What does being trans* mean? A trans* (also ‘trans’) person is someone whose gender identity is different to that which they were assigned at birth (i.e. what was put on their original birth certificate), or whose gender expression or presentation differs from the typical, and who self-defines as trans*. There are a number of different identities that fall within this umbrella term, of which a few are detailed below. People may identify with one or more than one of these labels as appropriate to themselves. Trans man/FtM/Female to Male transgender person: A trans* person who was assigned female at birth but who has a male gender identity. The terms “FtM” and “Female to Male” can be considered offensive, so these should only be used if the person has referred to themself as such. Trans woman/MtF/Male to Female transgender person: A trans* person who was assigned male at birth but who has a female gender identity. The terms “MtF” and “Male to Female” can be considered offensive, so these should only be used if the person has referred to themself as such. Genderqueer/Non-Binary: An umbrella term for gender identities that fall outside of the gender binary of male & female. Genderflop/Genderfluid: Gender identities moving between two or more genders, on varying timescales (varying as per person/time in their lives). Bigender: Gender identities that include both male and female, in equal or different measures. Agender/Genderless: An identity characterised by absence; a dissociation from both ends of the binary and all in-between. Neutrois: Similar to genderless; usually accompanied by a desire to hide or remove gender cues. Third gender/Other-gendered: Those who do not name their gender with respect to the binary of male and female. Tranvestites/Cross-dressers: Those who wear clothes typically associated with a gender other than their own. (Those who cross-dress may not always have a gender identity other than that which they were assigned at birth.). These terms are self-identification, so be careful using them about someone unless you are sure they are okay with it. Drag queens/drag kings: People who dress and act like a ‘caricature’ man/woman, often for the purposes of entertainment. Their gender identity may match what they were assigned at birth, or not. Being trans* is not a sexual and/or romantic orientation. Trans* people can be lesbian, gay, bi+, asexual, straight, undefined and so on, just like anyone else. What challenges do trans* people face? Trans* people’s gender identities may not always be correctly read by others. As a result they may be referred to using incorrect pronouns or terms of address (Sir/Miss etc.). Trans* people are subjected to transphobia in the same way that the LGBUA+ community is subjected to homophobia. Trans* people may be discriminated against in terms of employment, housing and services. They may be harassed and mistreated by others, both in public and at home by friends and family. A number of trans* people suffer from depression, self-harm and/or have suicidal tendencies. This can be the result of incongruence between their appearance and their identity, harassment, discrimination and prejudice. How do I address a trans* person? Most people have a preference for which pronouns you should use to refer to them. You should always respect this choice of pronouns, whether they be male, female or gender neutral pronouns. If you’re unsure as to which pronouns someone prefers, just ask them. If you’re not familiar with a certain set of pronouns, it’s acceptable to ask for further clarification. Alternatively, an explanation should be easily available online. For example, someone preferring ‘singular they’ pronouns would be referred to as follows: “Where’s Alex?” “They went to the park with their friends. Sandy went with them”. It may seem tricky at first, but we are all used to doing this when we don’t know someone’s gender, so you will learn quickly enough. Additionally, using the correct name for a trans* person is important. The name that they are using may not always be the name on their legal identification, but it is nevertheless their ‘real’ name. Some trans* people change their name a number of times before settling on one that they feel suits them. You should attempt to use the name which they prefer at the time, though it is acceptable to ask which name to use if you are unsure. Alternatively, some trans* people use nicknames. If they have expressed a desire to be referred to using their nickname then that is how you should refer to them. Making a mistake is not the end of the world, so long as you try your hardest to stick to the correct name and pronouns for the trans* person you’re addressing. If you do make a mistake apologise, correct your mistake, and move on. How can people be good allies to trans* people? A good ally to trans* people is someone who is respectful of their gender identity. Using their correct name and pronouns is important; if you’re not sure what pronouns a trans* person prefers, just ask. “What pronouns do you prefer?” is a perfectly acceptable question, and will be appreciated over using incorrect pronouns. If a trans* person is the subject of bullying or harassment and it is safe for you to do so, stand up for them. If the situation is unsafe, it may be appropriate to report it as a hate crime to the police, to comfort the trans* person, or to speak to us at trans@warwickpride.org for further advice. Educating yourself about trans* issues is also helpful. There are a number of links at the bottom of the page that may be useful in this regard. Why are trans* people included in the LGBT acronym? Trans people face many of the same problems as lesbian, gay, bisexual, asexual and undefined people in a heterosexist society; such as feeling isolated or ashamed of their identity, not having their identity represented correctly/respectfully (or at all) in the media, being the subject of discrimination or mistreatment due to transphobia (as compared with homophobia). Also, many trans* people are lesbian, gay, bisexual, asexual or otherwise already part of the LGBTUA+ community. Gender identity is also closely associated with sexual orientation. 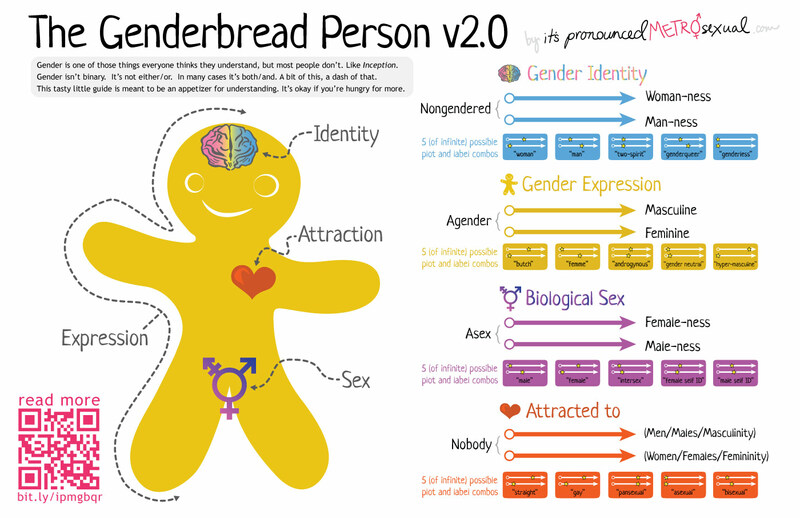 How you define your gender identity usually impacts how you define your sexual orientation. Furthermore, much of the LGBTUA+ rights movement was started by trans* people, and a lot of our successes (decriminalization of homosexuality, equal marriage, less stigma) have come as a result of hard work by the trans* community. Cis (non-trans*) people should aim to remember this. Warwick Pride’s Trans* Rep (trans@warwickpride.org). The Pride library, where we have a number of leaflets and resources. PFLAG’s guide for family & friends of trans* people. GIRES’ report from 2009 on the prevalence of trans* people. The Government’s transgender equality action plan from 2011.